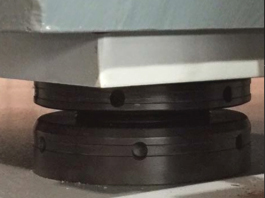 We offer you mechanically adjustable Rota Chock mounting chocks, used in machines and devices that require very precise settings, such as: engines, pumps, aggregates or compressors. Rota Chock are successfully used in all sectors of industries, where there is a need for foundation device and leveling it. They are very strong, adapted to work in any environment, economical, reusable and optimum surface contact. Vibro-isolators are used to reduce noise and vibration transmitted from the device to the environment (know as active Vibro-isolators), also to reduce vibrations transmitted from ground to device (know as passive Vibro-isolators). Each machine is a source of noise and vibrations resulting from dynamic and periodic forces. Most important think is the proper selection of Vibro-isolators and here we offer you our knowledge and experience on that field.